Ouds from the Cantigas de Santa Maria, c. 1257–83. The Arabian oud, or al ‘ud, is probably best known in the west for being the predecessor of the European lute; but it does have an independent life of its own in the history of early music, rooted in medieval cultural exchange between east and west. 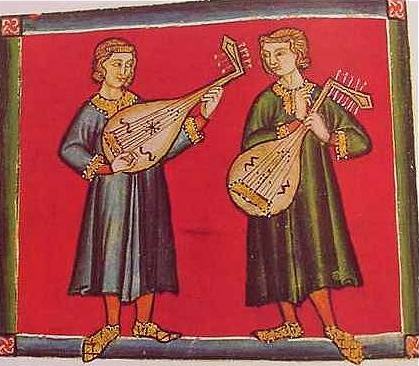 We know, for example, that ouds played an important part in the musical life of the royal court of Castile (in modern Spain) in the 13th century and, by extension, almost certainly Iberian musical life in general. But was the oud fretted, unfretted, or both? How did western musicians come to play an eastern instrument? And did the oud really originate in desiccated human remains? The oud was originally an Arabian instrument; its name, al ‘ud, meaning literally the wood. The back is made of several strips of bent wood, glued together to form a bowl, with a flat wooden soundboard. In common with all early plucked instruments, the oud has a rosette or rose, a decorative carved sound hole. The wood may seem an obvious and prosaic name for an instrument, possibly so named to indicate a wooden soundboard rather than one made from a stretched animal skin. It is strung in courses (pairs of strings) made of gut, processed from the small intestines of sheep, as most instrument strings were in the medieval period. There were four courses until the 15th century, when a fifth course was added; and it was played with a wooden plectrum, later changed to an eagle’s quill. No one knows for sure how far the oud dates back. There is a traditional story that Lamak, sixth grandson of Adam (the very first one), hung the remains of his son in a tree and used the desiccated skeleton to form the world’s first oud. The angle of the foot from the leg explains the bent peg box. If you’re conversant with the English song tradition and its American offshoots, this will be a familiar theme: there are similarly plenty of songs where female corpses are made into fiddles, harps and banjos. Depending on what you are prepared to believe, the oud may first have appeared between 3500 and 3200 B.C. but they’re such vague depictions that they could be almost anything. The first evidence of instruments we can really say are ouds are in the art of the Sassanid era of Iran, the last Iranian empire before the rise of Islam, from A.D. 224 to A.D. 651. An image on the left of something or other from Mesopotamia, 3500–3200 B.C. While the British Museum, who holds the artefact, would like to claim this is the earliest depiction of an oud, this vague outline of a figure could just as well be holding a fishing rod or a clothes hanger. Middle and right are two very clear oud players on a metal cup in the Sassanid era of Iran, A.D. 224–651. We usually take early music to mean medieval, renaissance and baroque western music, but there is a good reason for including the oud: then as now, those geographic, cultural and musical boundaries are porous and, especially in medieval music, distinctions between east and west can soon become impossible to pin down. In the middle ages, easterners and westeners were not only knocking seven bells out of each other in the Crusades, they were also trading and engaging in fruitful cultural exchange. Alfonso X, “The Wise”, 1221-1284, was King of Castile and other regions in modern day Spain and Portugal, and nothing illustrates the spread of the oud from east to west better than his reign – quite literally, illustrates. During his reign he wrote and commissioned a large number of books, with subjects ranging from art and literature to scientific texts translated into Castillian from Arabic originals. The most significant of Alfonso’s books for our purpose is the Cantigas de Santa María, a collection of 420 songs in praise of the Virgin Mary, written by Alfonso, aided by anonymous courtiers. (Click here for an article about the composition of the Cantigas.) His melodies were adapted from sacred sources or popular melodies from both sides of the Pyrenees, including some derived from Provençal troubadour songs and others that have striking affinities with Arab music. The Cantigas, written c. 1257–1283, are richly illustrated with pictures of musicians, giving us much information about the instruments of the day. Though the oud is an eastern instrument, entering Europe in the 9th century via Moorish rule in Iberia, one striking feature of the depiction of the three ouds in the Cantigas is that they are all played by western Christian musicians. Two of these ouds are at the head of this article, the third is below. Though some parts of the oud-playing world, such as Iran, had fretted ouds all the way from the 10th to 17th centuries, they were always in a minority. For most of its history and in most places, the oud has been fretless and, even in Iran, the abandonment of frets started to take place in the 16th century. In 1283, Alfonso X commissioned a book of chess endgame problems, from which the illustration on the left comes. We see a woman in Arab clothes on the left of the board, with henna-decorated fingers, a woman in Christian clothes on the right of the board and, on the far left of the picture, a Christian oud player, playing with a quill and what appears to be a fretted neck, though the different colours of the vertical lines means they are more likely to be fingerboard decorations than frets. Looking at the single rose instead of the oud’s multiple roses and the more lute-like pegbox, it is tempting to describe this as a transitional instrument, a proto-lute. The two ouds in the illustration that heads this article are fretless, taken from the Cantigas de Santa Maria, 1257–83, as is the one above right, the placing and patterns of the lines on the neck showing them to be clearly decorative. Click picture to play – opens in new window. A dance on Cantiga 353: Quen a omagen da Virgen from the Cantigas de Santa Maria, played on two Cantigas instruments by The Night Watch: Ian Pittaway on oud and Andy Casserley on bagpipe. Whatever its uncertain origins, the popularity of the oud spread across the Mediterranean, the Middle East and north and east Africa, where it remains popular to this day. By between 1300 and 1340 the oud had become modified enough by Europeans to become a different and distinct instrument, the medieval lute. By a little after c. 1400, western lutes were increasingly fretted and by 1481 the medieval lute had developed into the renaissance lute, the most important western instrument of the period, by then mirroring the importance of the oud in the east. Do you have a view on the Sufi specialist Sayeed Idris Shah’s assertion that the original troubadours were from 10th century (Christian calendar) Spain, and that the word Troubadour derives from the Arabic roots TRB (to play) and OUD? Western iconography may suggest otherwise, but the etymology feels convincing to me. Hello, Meic. I haven’t heard that idea before. I’d need to be convinced that the French ‘troubadour’ derives from the Arabic ‘play wood’. I know there were troubadour connections with Spain and Italy, so it’s not impossible, and of course there were so many medieval musical connections between east and west. Often the most straightforward answer is the right one, so I’m more convinced by the simpler and more obvious evolution from ‘trobador’ (Old Provençal) meaning someone who finds or invents musically, itself probably derived from ‘tropare’ (Vulgar Latin), meaning to compose or sing, which is where we get ‘trope’, a figure of speech or motif. Either are possible, but Sayeed Idris Shah’s assertion seems a little like special pleading to me and the Provençal connection seems more natural linguistically and geographically. I wonder what you make of that. I cover the troubadours a little in my article on the vielle, which you may have seen. As I understand Shah (it’s some years since I read the book) TRB OUD R became “trobador” in Spanish also meaning “finder” and spread to Provencal, where the verbal connection to the lute was lost and the finder use was transliterated directly from Langue d’Oc to “trouvere” in Langue d’Oil. Given the pleasure the Moors and Sufis took in punning, the convergence seems pausible to me, and the crossword setter in me finds the idea delightfuil, but I’m not a scholar of historical philology. I did read the articles (both of them!) on the vielle, and certainly the western iconography places the fiddle at the heart of troubadour culture in Provence. Hope to see you when the Night Watch play the Lewes Folk Club later in the year. Oh, I see, Meic, so Shah takes the Old Provençal into account. I’m not a scholar of historical philology, either, but that’s an intriguing theory. It would be interesting to know if he has any evidence for the connection, factual or conjectural, or if he can trace cultural and musical connections as well as linguistic ones. Yes, it will be great to see you at Lewes Folk Club. It is clear that many early Ouds had frets, and that the Oud eventually lost its frets. In ancient times, ouds of both fretted and un-fretted types were in use. The great theorist al-Farabi (10th century) used the fretting of the oud to analyse the tonal system. Safavid [Persian] miniatures occasionally portray fretted ouds, but the Ottoman instruments of that period seem to have been unfretted. During the 16th century the Ottoman Empire ruled the entire Middle East and North Africa with the exception of Iran and Morocco. The unfretted oud spread with Ottoman cultural influence in the region, which extended to the local musical traditions in the provinces. When playing Western style medieval music with an Oud, I prefer to tie on frets. This has proven to be an historically informed practice.